On June 13, 1945, Ensign Herbert J. Audet took off from Charlestown Auxiliary Naval Air Station in Charlestown, R.I., for a gunnery training flight off Block Island. 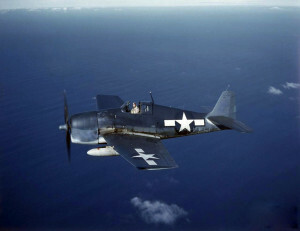 He was piloting an F6F-5E Hellcat, (Bu. No. 72735). After making a run, he began to climb and noted that the oil pressure began to drop. The propeller went into a low pitch, and as the oil pressure continued to drop the engine froze. Ensign Audet was able to make a safe emergency landing in the water about a half-mile south of Block Island. He scrambled out of the plane before it sank, and was rescued a short time later. National Archives, AAR 11-45; TD450613RI, via Larry Webster, Aviation Historian, Charlestown, R.I.